Home Gig is a creative services company specializing in marketing, branding, and functional creativity. Home Gig was asked to create a stunning custom Quinceañera invitation for the upcoming festivities of Nicole Ashley O'Neill. Insisting on a Paris themed event, the birthday girl asked Home Gig to create a beautiful hand made invitation suite to impress her guests. Using pink and teal blue colors against black embossed glitter was the obvious choice. Each component of the invitation was hand cut using thick, card stock and included a keepsake passport which was secured using black silk ribbon. 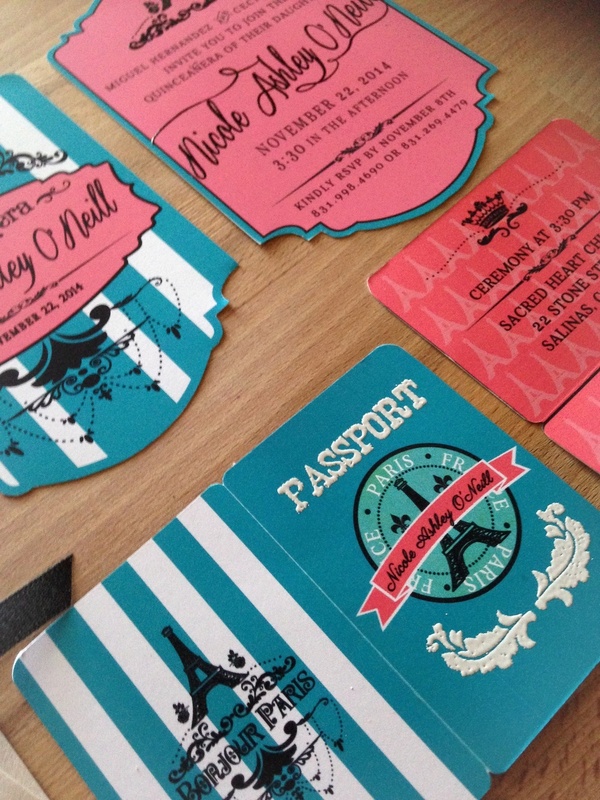 Invitations were placed in a custom lined envelope complementing the Parisian theme color palette. Feliz Cumpleaños Nicole and Happy 15th! Welcome. Home Gig is a boutique creative agency in business since 2012 and growing daily. We are a powerhouse team able to reach a large network of clients with the ability to provide a wide range of design and creative needs. Home Gig specializes in home management, marketing planning, and creative services. We offer a variety of a la carte services to suit your marketing needs, including, rental refreshers; graphic design; event/photo shoot styling and staging; home management; and personal services. We would love to start a conversation about how we can help you with your current and long-term home and design needs.